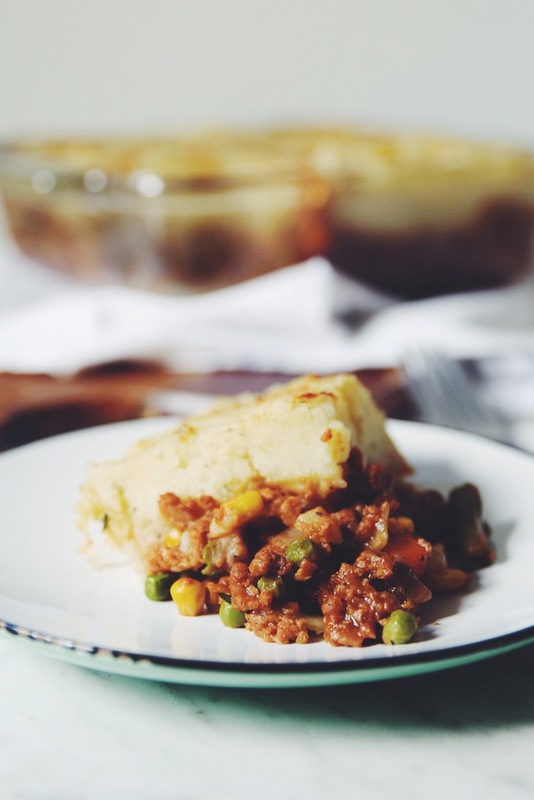 This vegan shepherd’s pie recipe was part of the Vegan It! series I created in collaboration with Chatelaine! 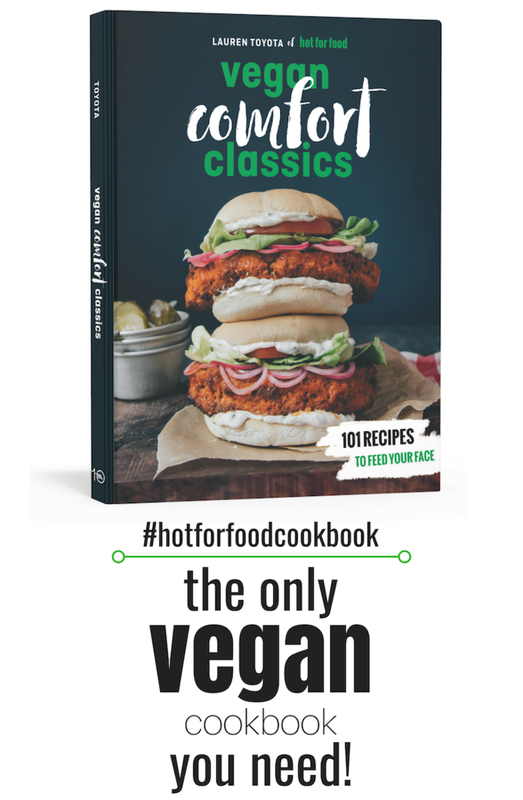 I was recreating all kinds of comfort classics for this fun series on their YouTube channel and making them 100% vegan. Of course, shepherd’s pie is all beef, but don’t fret. Making it vegan is as easy as swapping the meat for a veggie ground round which you can find at every grocery store! Check out how this all comes together in the video below or keep on scrolling for the full written recipe. 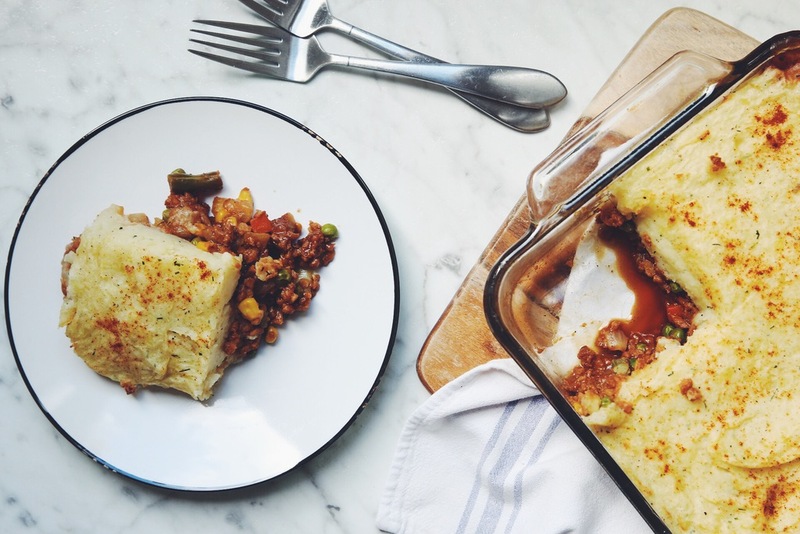 This vegan shepherd’s pie recipe was part of the Vegan It! 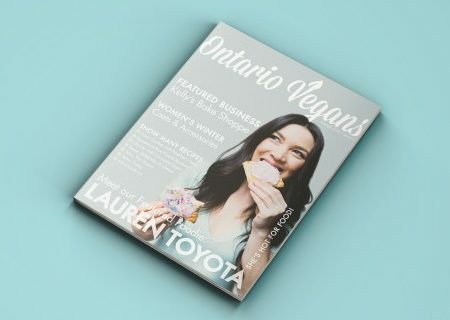 series I created in collaboration with Chatelaine! To make the mashed potatoes, bring a large pot of cold water with the potatoes to a boil. Cook until tender and falling apart easily, 10 to 12 minutes. Preheat the oven to 400°F. You’ll need an 8" x 8" square baking dish. To make the ﬁlling, sauté the onion in a skillet with the vegetable oil over medium heat for 3 minutes until just softened. Stir in the garlic, thyme, sage, salt, and ground black pepper and heat through for about 1 minute. Add veggie ground round and mixed vegetables, and continue to cook for 5 minutes. Mix together the low-sodium vegetable stock, worcestershire, tomato paste, and cornstarch. Mix cornstarch with a bit of the liquid to make a slurry before adding to all of the liquid to prevent lumps. Stir well. Then add to the pan and stir for 1 minute as the liquid thickens. Turn off the heat. Drain the mashed potatoes from water and add back to the pot you cooked them in. Mash with vegan butter, nondairy milk, sea salt, ground black pepper, and chives until smooth. Add the filling to the casserole dish and spread out in an even layer. Then add all the mashed potatoes on top and use a spatula to spread it out evenly to the edges. Sprinkle with smoked paprika evenly on top. Bake on the middle rack of the oven for 20 minutes or until the top is golden brown and the filling is bubbling. If the top is not getting golden, move to the top rack for another 5 to 8 minutes. Let the shepherd’s pie rest for about 10 to 15 minutes before slicing and serving. So we’re having a snowstorm outside and I’m eating the last of the shepherds pie. Definitely a comfort food. Tasty recipe, straightforward and easy to make.